What kind of tree/bush is it with the red leaves? Thanks for getting back to me. I appreciate it! Wow this is one of the best formally informal borders I have seen. I love it. I really like the pea gravel edge to keep the grass out and also creates a walking path. The design is nice so if something dies its not a biggy. Looks like bee heaven. How long would you estimate this look took to fill out? Thanks for your question, this garden was built from scratch and was originally a field. All the plants you see in this photo were planted in April 2012 and this photo was taken in 2014. The key is not to plant too close together, they look like dead sticks when they first go in and many clients initially think that you have underplanted their garden. 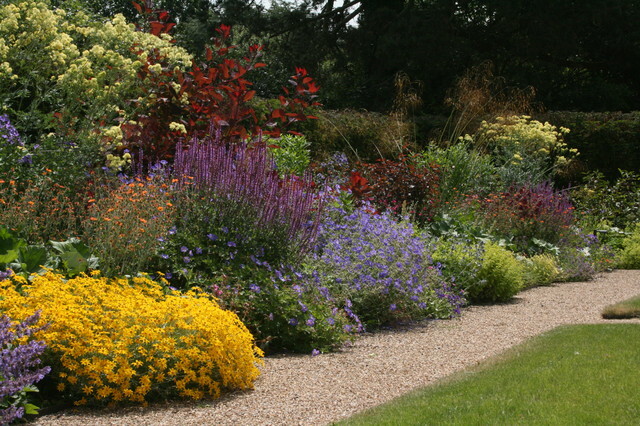 Perennials plants, as per the ones in the photo, establish and spread out fairly quickly. The yew hedging behind was already 2.5m tall when planted. In March this year (2016) we undertook the first splitting and moving of the plants to fill gaps or put plants elsewhere in the garden. We have been adding well rotted manure each Autumn and this year the soil quality is great and hopefully 2016 will be a good show. It is the one job that I have not really left and learnt so much from. This is an exposed site with heavy clay soil and I visit regularly and I am always constantly amazed at the ability of plants to thrive even in tough conditions. Sorry for the delay in responding, Yellow flower is Eriophyllum lanatum and the blue flower is Salvia nemorosa Ostfriesland. Regards, Rachel.